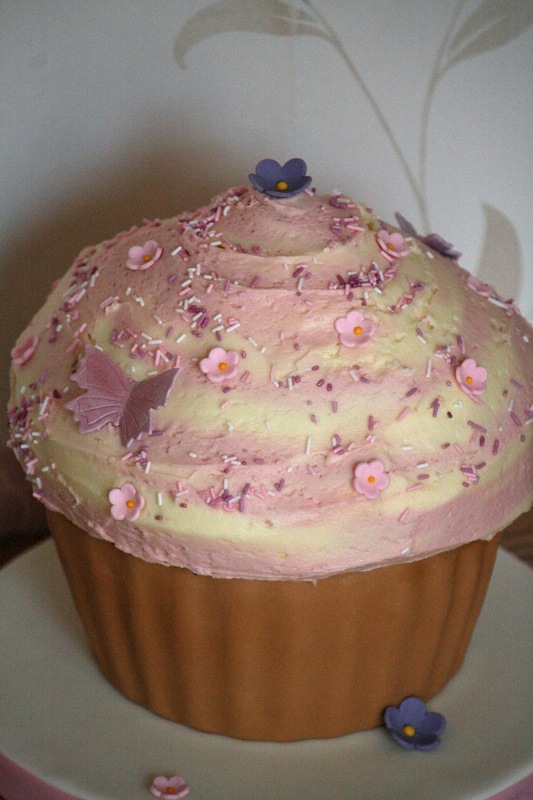 If a regular sized cupcake doesn't quite hit the spot...why not make yourself a giant cupcake! I've always admired the pictures of giant cupcakes that I've seen but I've never made one myself. So when the Cake Decorating Store recently offered to send me an item from their website to review, I thought it was the perfect opportunity to try out a Giant Cupcake Tin. If you are looking for cake baking and decorating equipment then you can find everything you need at the Cake Decorating Store. 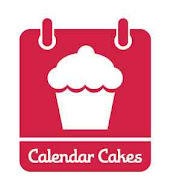 If you want to make a giant cupcake or any other cake check out the Cake Decorating Store website for bakeware, boxes, icing, colours, dusts, cutters and lots more. The cupcake tin came with a recipe and instructions for a Double Chocolate Pound Cake made with cocoa powder and chocolate chips. By using a pound cake recipe, it means it's a bit denser and will hold it's shape better and support the weight. The recipe did state that it would take 60-70 minutes to bake, mine took closer to 100 minutes but this may have been my oven! The good news is that it came out of the pan very easily thanks to the Easy Bake spray you can see at the end of the post. You can obviously choose to decorate your cupcake anyway you choose as you can see from these images of other giant cupcakes on Google. I chose a fairly simple design covering the base in a teddy bear brown sugar paste and then using buttercream on the top. 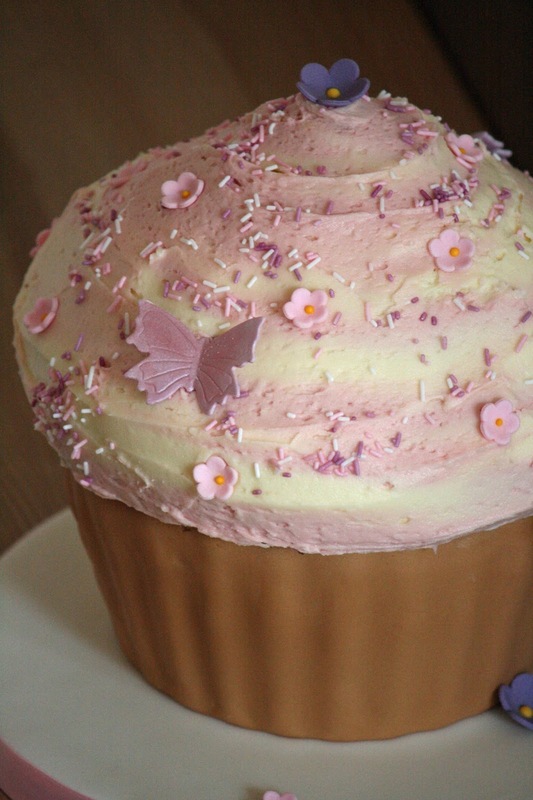 To get the raspberry ripple effect on the top, I coloured half my buttercream with a pink paste colour and then filled my piping bag on one side with plain buttercream and then the other side with pink buttercream. I then piped it on and used a palette knife to smooth it down. To finish off I added some sprinkles, along with florist paste butterflies and flowers. You can make your own butterflies and flowers using the cutters you can see in the equipment picture. To get your butterfly wings to open upwards, fold a piece of card lengthways and place the butterflies in the fold to dry in position. You can also use the corner of a cut cereal packet for this which is what I use. To present my cake, I put it on a cake drum that had been covered with white sugarpaste and then finished with a pretty pink ribbon around the edge. You could of course also put it on a plate, cake stand or an uncovered cake board. 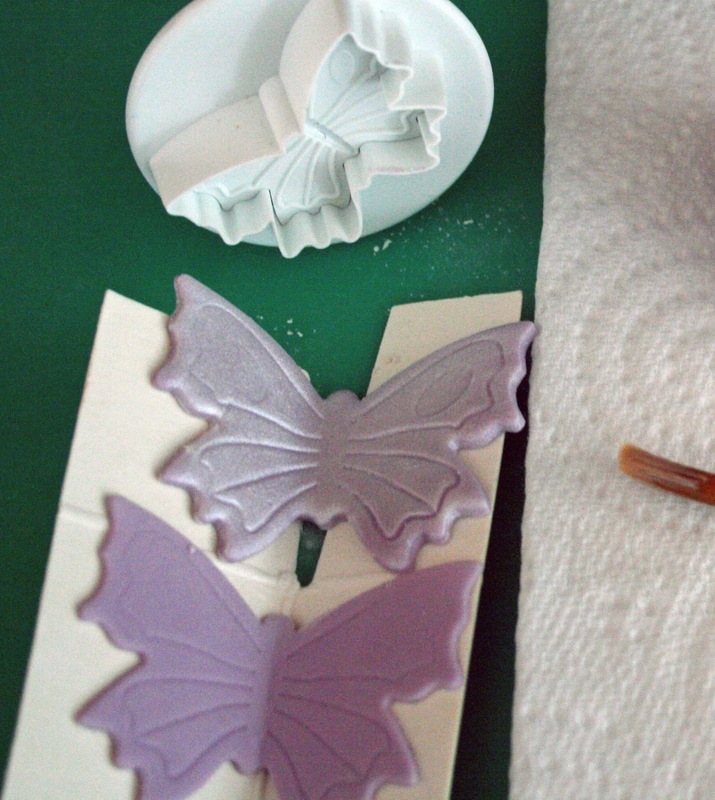 Sugar Florist Paste - a firmer paste that dries hard, useful for making the flowers and butterflies. 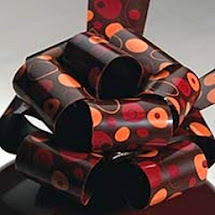 Ribbon - Give a neat finish to your board. 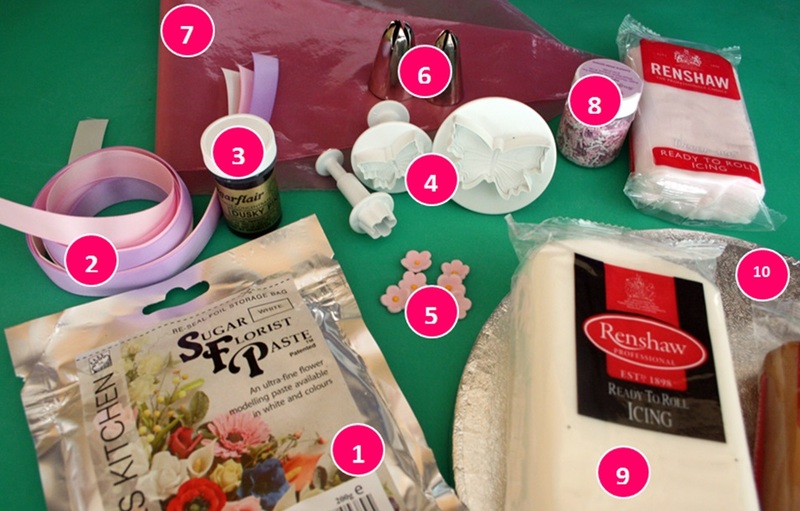 Sugarflair Paste Colour - to colour white sugarpaste or florist paste. I also used it to colour my buttercream. Cutters - to create butterflies and flowers, although a whole array of cutters are available. 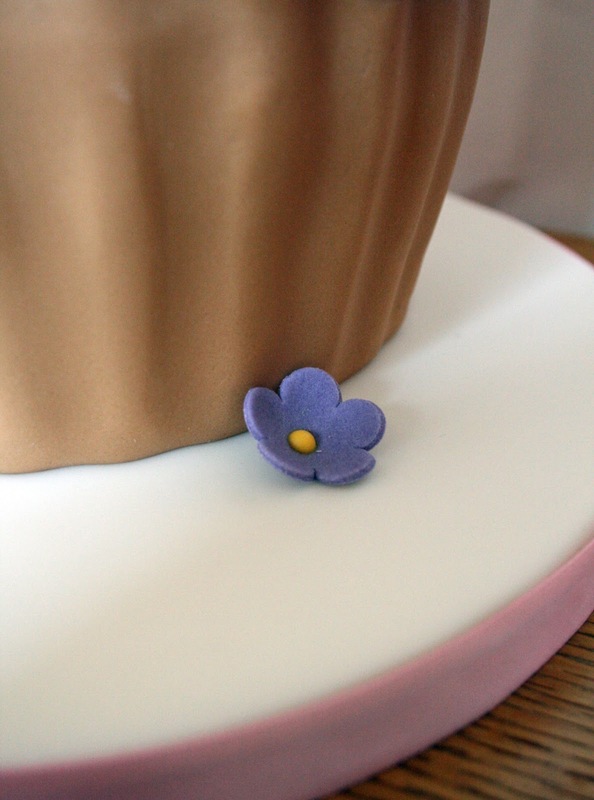 Used to cut the sugar florist paste. Ready made flowers - if you don't have the time or inclination to make your own. Sugarpaste - for rolling and covering cakes and the board. Cake drum - to stand your cake on. 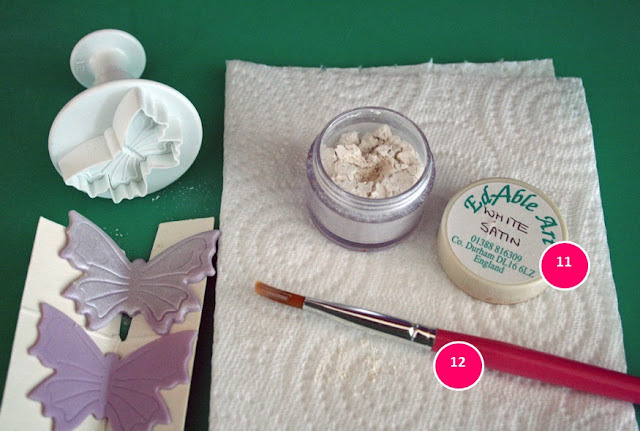 Lustre dust - to add an extra dimension to the butterflies and flowers. Dusting brush - to apply the lustre to your decorations. 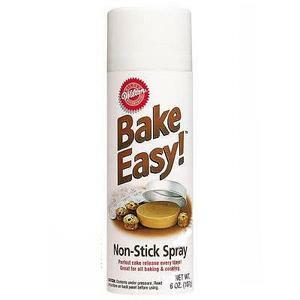 If you haven't tried it already you might also be interested in Wilton's Bake Easy Non-Stick Spray. The recipe that comes with the pan suggests using a cake release and a light coating of flour in addition to ensure your cake comes out easily. Disclaimer: I was sent the Wilton Giant Cupcake Pan free of charge but was not paid for this post. All opinions are my own and all other equipment and materials, I supplied myself. That is definitely a GIANT cupcake. Had no idea they sold a kit for this, looks awesome! Wow - now that's a fine piece of work! Wow! The detail is amazing, and the cupcake is HUGE. It must have been a tense extra 30 minutes.. at least it would have been for me! Wow I have never had the nerve to make one of these, yours looks amazing. I think I would be too nervous of the baking times for something this big, but then again maybe I should just bite the bullet and give it a go. Yours has definitely inspired me to think about giving it a go. I've always wanted to make one of these!! How cool! This is one of the best giant cupcakes I've seen. I always have trouble decorating mine and making it look neat. Guess I'll have to get myself some sugar paste and cake decorating equipment! It looks beautiful Laura, you are so meticulous, but the result is perfect. A giant cupcake? Amazing - you've decorated it so prettily too. 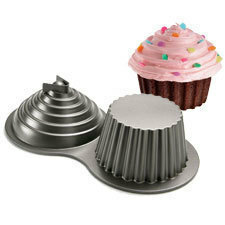 I love those giant cupcake moulds. 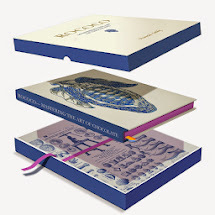 I need to buy myself one soon, just wish they were a little cheaper... Might have to treat myself.